Yes, I did some rolling. But all culinary praise must go to my wonderful and talented host for this baking-and-wine afternoon excursion: Jeanne Sauvage. She’s the author of Gluten-Free Baking for the Holidays; that’s where you can find the recipe for these cheese straws and crackers. (I am a firm believer that a sunny Wednesday in Seattle counts as a holiday. Especially when you have delicious cheese crackers and sparkling wine, no? Hell, every day you bake is a holiday!) And after you pick up a copy of Jeanne’s book (and a couple dozen to give away as gifts), make sure to bookmark her blog, Art of Gluten-Free Baking. Once our baking was done it was time to head out into the garden and enjoy the fruits (cheeses?) of our labor. And have some dang wine! I must say, I was mightily impressed with the Champagne coupes Jeanne provided. I am not immune to the charms of a fancy, ornate drinking vessel. So what sparkling rosé did I select to enjoy in all that sunshine? The Tenuta Col Sandago. Hailing from the Veneto region of Northern Italy, this wine is most notable for being made from an unusual grape: Wildbacher. 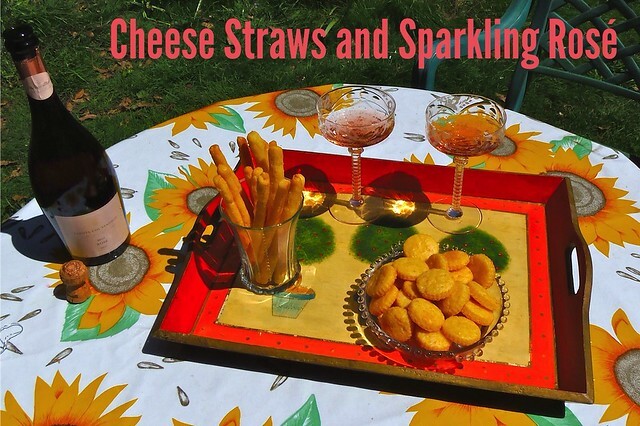 It’s an Austrian import that, in this case, makes an elegant, pretty rosé that pairs wonderfully with the crunchy, salty, cheesy straws and crackers. About the only thing I love as much as the Tenuta Col Sandago is this new (to me) app for the iPhone, Over. It allows you to add text (or “typography” as Over calls it) to your photos. It’s super-easy to use and super-addictive. I probably (ok, definitely) went a little overboard with this post, but I am in the honeymoon phase with Over. Which could last forever. Or, forOver. 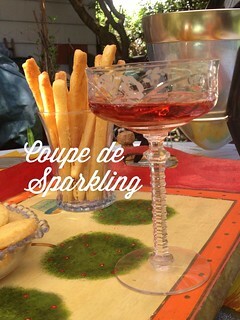 And be sure to read Jeanne’s recap of our sparkling afternoon. 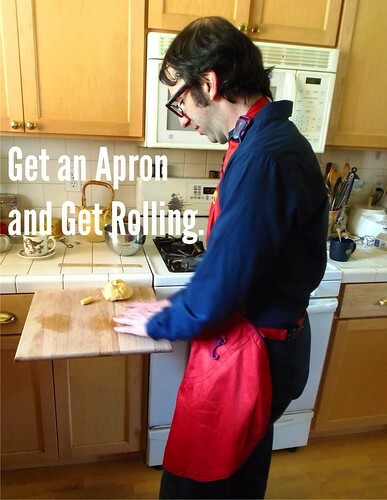 You look cute in apron, you should definitely wear them. You really know how to make a fella’s day. Thank you so much. I checked out your blog; love that gorgeous cinnamon roll. There is so much to love about this post…where do I begin?? Sparkling rosé (just enjoyed some last night), those GLASSES (please, where can i get some? 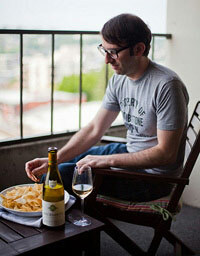 ), cheese, crunchy, salty cheese, aprons…oh my!! lovely post! thanks & cheers! The coupes are Jeanne’s family heirloom. They are lovely, huh? Enjoy “Over” but just learn from me and try not to go Overboard.